Potsdam is a gorgeous daytrip, easily done in around 6-7 hours (including travel). Enter a completely different world, far removed from the hectic pace and urban jungle that is Berlin. Potsdam not only has beautiful gardens and palaces but also significant Cold War history. See where the division of Germany was ratified after WWII with the ‘big three’ in attendance, or where some of the most notorious spy exchanges took place at the Glienicke Bridge (featured in the recent Bridge of Spies film). 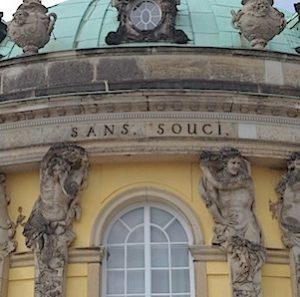 See where Frederick the Great lived and was (eventually) buried at the palace of Sans Souci. Along the way we can pass by the former prison and ‘Forbidden City’ of the KGB. There is a Dutch quarter, Russian village, and Norwegian boathouse – very international! Potsdam is a beautiful alternative city to Berlin which is rich with a history all of it’s own. Come and discover the City of Kings!